professionally laser cut STENCILS - allowing precise, detailed designs. No hand or machine cutting FOUND here! Our line of stencils and kits have been designed for both professional and novice crafters alike and truly allow you to “Create-It-Yourself”. You can be certain that when you purchase a stencil from Primitive Designs Stencil Co., it has been designed by professionals who understand the look you're wanting to create. For professional crafters, our stencils help you to achieve a finished product in less time than hand-painting. They also help you to have a consistent look that your customers will appreciate. We offer custom stencil cutting and an On-Line Custom Stencil Designer for those of you who design your own stencils. Please visit the Custom Orders section of our website for additional information. For novice crafters, the items you make for your home and the gifts you make for family and friends will have a finished look that will make you proud to say, “I made it myself!” You just might find yourself starting your own business after you see what you can create with our stencils! Be sure to read what our customers have to say about our stencils! Below are some frequently asked questions that will answer some of your questions. Please don’t hesitate to Contact Us if you need additional information. How do you measure your stencils? Why should I use stencils? What are your stencils made of? How are your stencils made? Are these the same stencils you use? Where can I purchase your stencils? What is the secret to stenciling? Can’t I hand-cut stencils myself? Why are the stencils that I find in craft and department stores sometimes less expensive? Why are some of your stencils priced higher than other stencil companies? Where are your stencils made? How should I clean my stencils? What should I do if a stencil gets torn or damaged? What type of brushes do you use? Can I use your stencils to make and sell item? How can I learn more about your custom stencils? How are your stencils measured? The size of our Alphabet Sets are determined by the uppercase "A". For instance, if you order a 3" Alphabet Set, the uppercase "A" will measure 3" and all other letters, both upper and lowercase will be proportionate to the "A". For signs and all other designs, the measurements provided include the design only, the actual stencil will be larger. 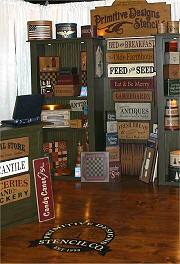 After making hundreds, if not thousands of signs, shaker box sets, game boards, etc, we know how beneficial stencils are. Stencils allow a consistent, professional looking finish. ALL STENCIL MATERIAL IS NOT CREATED EQUAL! A few look alike sites have 'popped up' and claim to have material equal to ours. We have personally tested numerous types of stencil material and through this testing we have chosen a .5 mil and .7 mil material. If you have been unhappy with stencils you've purchased from another stencil company and are a bit hesitant about buying again, please consider ordering a sample of our material and see for yourself the difference in quality. The .5" mil material we have chosen is wonderful when working with shaker boxes or any curved items because it easily forms to whatever surface you are working on. The .7 mil material is perfect for signs and larger stencil designs. Some will lead you to believe that thicker is always better. This simply isn't true. When working with a small, detailed design, a thick 7 mil. material becomes a bulky nightmare. Our stencils are professionally designed and laser cut to insure precise, detailed designs. Hand cutting or so-called 'stencil cutting machines' simply do not produce the crisp, clean designs a laser is able to provide. We're truly a stencil manufacturer with professional equipment and are set up for stencil production only. This is not a "side job" or an after-thought of another business. Right here at this site. You will not find our stencils offered through any other company, web site or online auction site. We have many customers who buy from other companies assuming they are purchasing our stencils, but contact us because they are disappointed with the quality, stencil material or customer service. We do have a select few businesses who sell our line of stencils through gift or craft shops in towns throughout the country, but you will not find them online. Again, yes! The stencil material we use is very durable and will last for many years. As with any stencil you need to keep them clean and store them flat to avoid bending or creasing them. There really isn’t a secret and we don’t perform magic. As with most techniques, the more you practice the better you become. Every stencil comes with a full color photo or graphic and a Hints & Tips sheet on how to achieve the look you see in our example photos and finished items. That’s just what we did for years. The only problem is hand cutting is very time consuming and stencil material can be quite expensive, not to mention too thick most often. Our professionally cut laser stencils give you a smooth, centered stencil that can be difficult to get when cutting them by hand. For those of you who wish to cut them yourself, we do offer .007" mil. stencil material found in the Supplies section of our site. Because ours are professional stencils that produce superior results. Professional quality stencils like ours are flexible yet durable. Most mass-produced stencils that you find in stores will be thick, opaque and difficult to work with. When using them on curved surfaces, the edges and cutouts tend to “pop up”, which makes it next to impossible to achieve the clean lines we want on our finished products. Large companies that mass-produce their stencils and sell them nationally in large quantities. This is why you see the same stencil in every craft shop and discount department store. It’s difficult to have an original look when “everyone” is buying the same stencil. Simple... 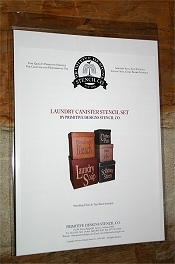 The stencils you see that are priced higher are the stencils we sell in sets. These sets were designed with you, the crafter, in mind. The average professional stencil costs between $14.95 and $32.95 EACH, depending on the detail and size. By offering you sets, we are allowing you to purchase all the stencils you will need for a project for less money. We do offer single stencils for those of you who do not wish to purchase an entire set. When you purchase a stencil from Primitive Designs Stencil Co. you are buying a product that has been designed and manufactured in the USA! In most cases, soap and warm water will do. But for those of you who allow several layers of paint to build up, rubbing alcohol will do the job. Please be certain to test any other stencils you might have before using this method. Some stencil material will be destroyed by rubbing alcohol. Please do not use SOS pads or any material that will scratch or mar the surface of your stencil. You have many options when it comes to choosing the right paint for your project. Acrylic craft paints come in a wide variety of colors and are easy to use. Oil based paint will give you a very traditional look, but will take extra time to dry. Stencil creams and sticks work wonderfully, but are a bit more expensive and do not offer as many options for colors. The colors we have used for the example of the stencil is provided along with a color photo. a smaller brush, such as 1/4" will be much easier to handle. Yes you may use our stencils....but please read our copyright information to further educate yourself about how you are allowed to use them. A section of our site explains our custom stencil services and how to order. Please click here to learn more. All stencil designs and instructions are copyrighted from reproduction. This means that you may not duplicate any stencil or instructions and resell them as stencils, graphics, clipart, patterns or in any other manner. Professional crafters are free to use our stencils to create items for resale as long as the individual who purchased the stencil(s) is stenciling the item(s) on their own. Mass reproduction is strictly prohibited. What does our copyright mean? Our copyright protects us from reproduction of our stencil designs and instructions. This means that another stencil company or any other company or individual may not duplicate our stencil designs or instructions and sell them. We own the rights to the design, but when you purchase them from us, you own the rights to use them to create items for personal or professional use. import companies or individuals who mass-produce or license their products are prohibited from using or reproducing our stencils. Our line of stencils have been created for the American crafter who wish to produce consistent, high quality items in less time than hand painting requires. We will pursue legal action against ANY company or individual who does not comply with our copyright. By doing so, we protect our customers who have purchased our stencils. They simply can not and will not be expected to compete with imports. © 1998-2005 - Primitive Designs Stencil Co.